The Webtrends SaaS Operations Team has spent the last few months working on improving our Data Collection Centers. As part of our plan to improve security, performance, and resilience of our systems, we added new data collection centers. 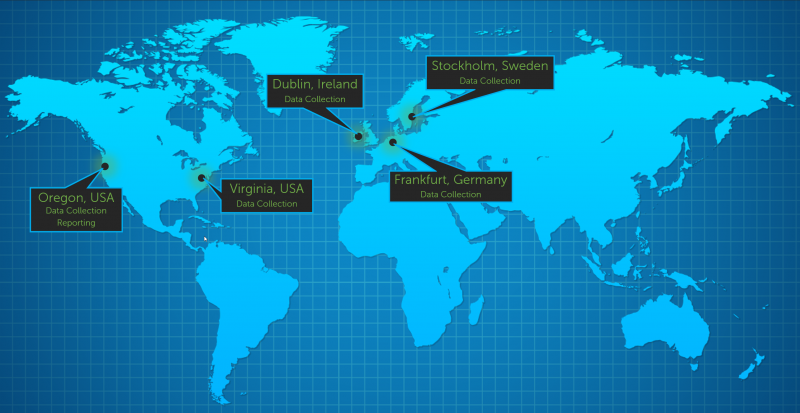 We added Data Collection Centers in Dublin, Frankfurt, and Stockholm to better service UK/EU traffic. In addition, we added a Data Collection Center in Virginia to improve US-based traffic. The new Webtrends Data Collection Centers now have encryption at rest. This means that data temporarily stored at each location before delivery to the Data Processing Center are encrypted on disk. Webtrends Data Collection Centers are now closer than ever to your site visitors. Your web pages will load faster as your visitors will automatically send data to the highest performing Data Collection Center. This is usually the nearest location, but in the case of Internet issues, it might be further away if our automated systems find a faster location. The additional locations also means that if any one location is unavailable due to maintenance or Internet issues, one of the other Data Collection Centers will automatically receive the data.